There are not very many good pictures of Deimos. Here's a new Viking composite that I just put together. What a weird little world, shaped like a lost baby molar, with its flat or even concave south pole. 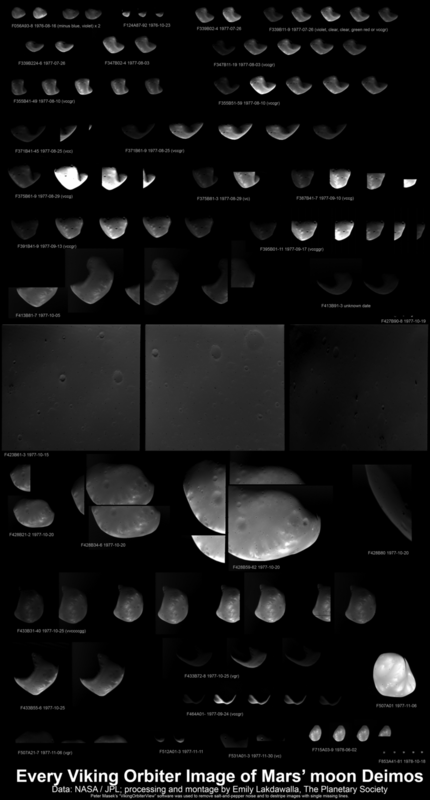 It was pretty easy for me to find the data for this one because, several years ago, I made myself a cheat sheet: a summary of all the Viking orbiter images of Deimos. This is it; this is the data set. There may be a few other images but they're all tiny. You can see the original images for the composite above in the third row on the left. Now that I have this summary, I can grab a set of images and have fun processing without going back into the Planetary Data System. Any of you could, too -- have at them! 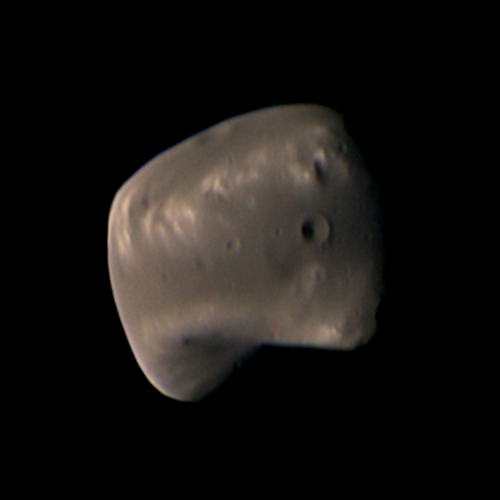 Mars' outer and smaller moon Deimos appears in 111 Viking Orbiter images gathered between August 16, 1976, and October 18, 1978. Targeting Deimos was a challenge, and it was often cut off at the edge of the frame. I love how these images and data sets from earlier missions are still providing new views and insights! Thank you, Emily!